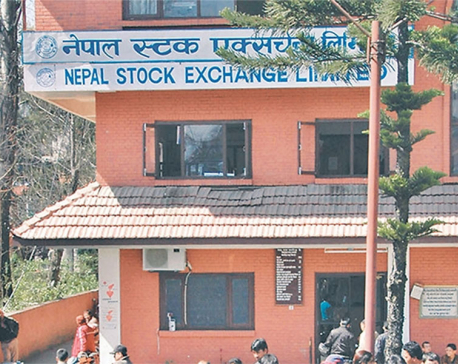 KATHMANDU, Dec 23: Freefall of stocks continued this week too as Nepal Stock Exchange (Nepse) benchmark index slumped 36.99 points to close at 1,472.15 points on Thursday, the last trading day of the week. According to analysts, the current political impasse in the aftermath of recently concluded elections has dented investors' confidence. "The stocks were already stagnant even when the country was holding elections. 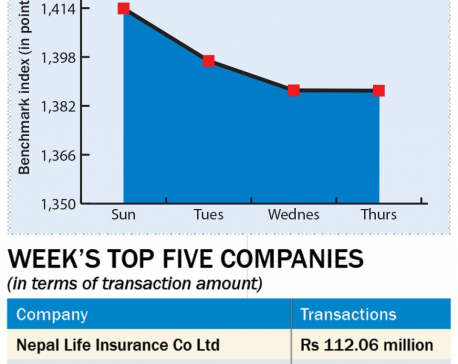 The left alliance emerged victorious which had become a cause of concerns for investors," a broker told Republica, requesting anonymity since the regulators have restricted the brokers from making comments about the movement of stocks. "Instead of a smooth government transition, there has been a lot of debate and disputes on the political stage about the formation of the national assembly and the transfer of power. The deadlock has weakened investors' confidence which was already low," added the broker. Another factor that has driven down stocks is the shortage of lendable fund in the banking system and rise in the interest rates. Due to mismatch in the deposit and credit growth in banks, interest rates are rising again this year even before any significant correction. After remaining at a very low level for a couple of years, the interest rates had shot up to a multi-year high amid shortage of lendable fund, but had started to fall in the beginning of the current fiscal year. However, banks are again raising deposit rates to lure fresh deposits, indicating that the interest rates are likely to remain at the higher end in this fiscal year too. "As companies are not going to distribute dividends immediately, investors may not be tempted to purchase shares and hold it for some time when interest rates are climbing up," added the broker. Except 'Trading' group which went up 3.13 points to close at 198.99 points, all sub-groups registered loss this week. Insurance group suffered the highest loss as its sub-index plunged 206.33 points to end at 7,600.44 points. Hydropower group shed 50.15 points to finish at 1,990.06 points. 'Others' group ended 61.88 points lower at 849.7 points. Sub-indices of Microfinance and Development Bank also fell 50.94 points and 45.73 points, respectively, ending at 1,782.08 points and 1,683.88 points. Similarly, Hotels group went down 41.87 points and closed at 2,116.67 points. Banking, the heavyweight group, lost 23 points to settle at 1,260 points. Sub-indices of Manufacturing and processing and Finance groups fell 16.58 points and 4.68 points, respectively, settling at 2,541.53 points. 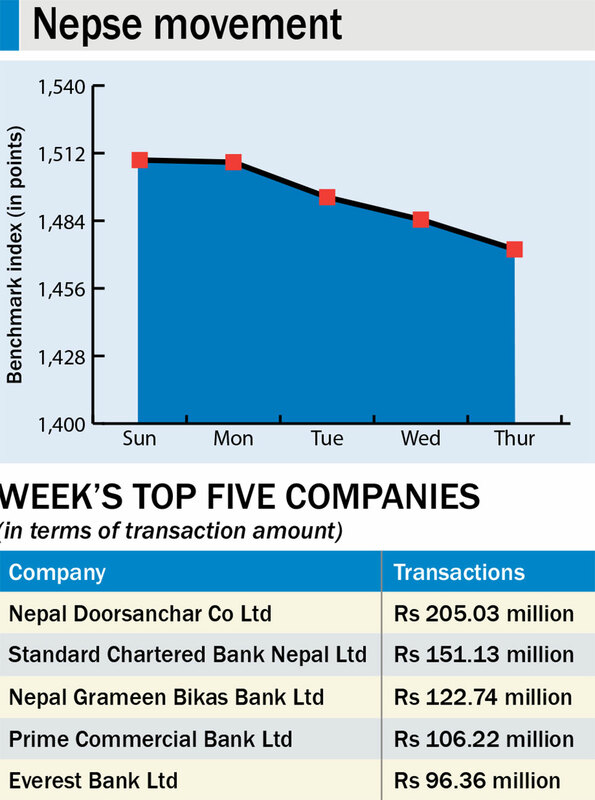 Nepal Doorsanchar Company Ltd topped the list of companies in terms of highest turnover (Rs 205 million). Nepal Grameen Bikas Bank Ltd became the top company in terms of traded shares (359,000 units) and number of transactions (1,707). Bonus shares of NIC Asia Bank Ltd, Prabhu Insurance Ltd, and Citizens Investment Trust were listed in the Nepse for trading while rights shares of Arun Finance Ltd and Saptakoshi Development Bank Ltd were also listed for trading. A total of 5.71 million units of shares of 177 companies worth Rs 2.58 billion were traded in the market this week through 24,655 transactions. The turnover was 11.92 percent lower than the total transaction amount registered last week.